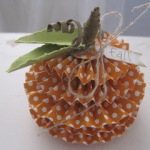 I cannot believe that it is almost October. It’s getting cooler outside and the leaves are starting to change colour. 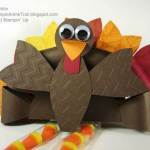 With this switch in season comes Thanksgiving. 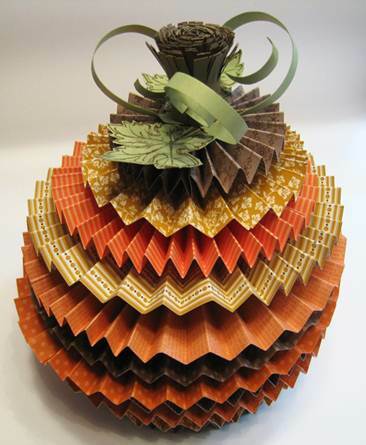 At work, I have been tasked with creating a Thanksgiving centrepiece that will be auctioned off with other handmade centrepieces for charity. 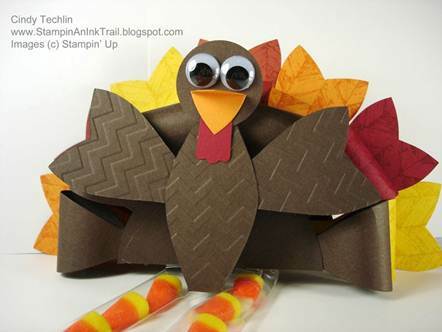 I have spent the last few days furiously scouring the internet trying to come up with ideas of what I could possibly make. 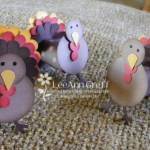 I thought I would share with you some of the ideas I’ve found in case you want to try your own handmade Thankgiving! 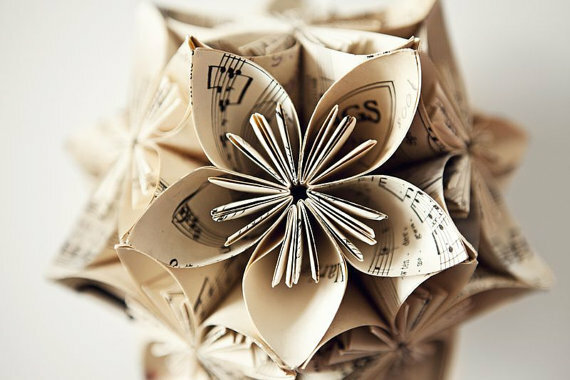 As you can tell, I’m mostly a paper crafter! 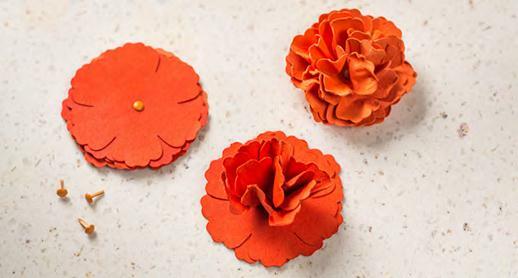 🙂 But with some decorative paper, a bit of plain paper, and some glue, you can make some pretty awesome things! 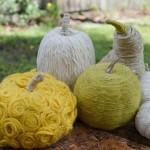 I am very tempted to try those yarn wrapped gourds though! They look pretty rockin! 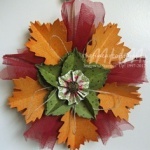 The centrepiece I’m creating will (hopefully) contain a twig wreath, some tulle ribbon, and several of the elements you see above. Wish me luck! 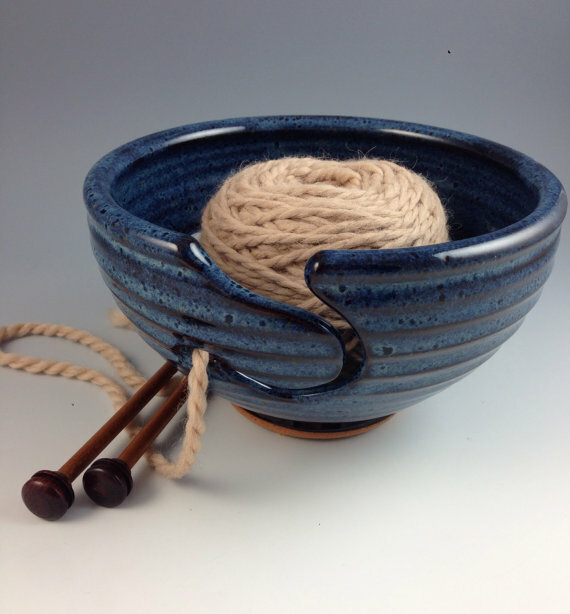 Yarn bowls are a beautiful way to keep your ball of yarn from falling on the floor and rolling around, getting under the furniture and being rolled over by your chair, gathering dust and keeping it away from your kitty (or from my knitting friend’s puppy, Perry!). 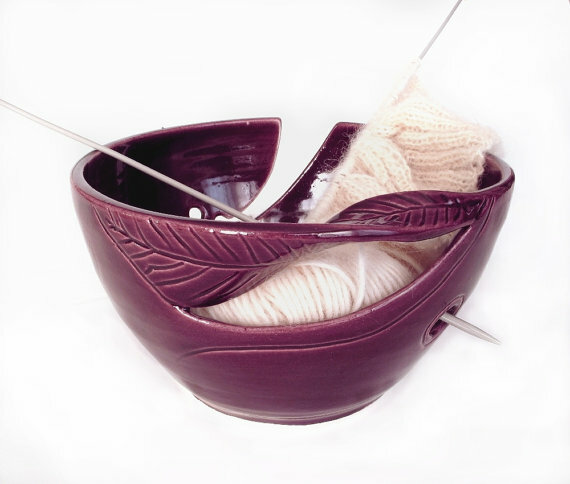 Good knitting bowls should be very smooth so that your yarn doesn’t catch. They should also be more bottom heavy than normal bowls which adds stability and doesn’t tip when you tug on your yarn as you’re knitting. 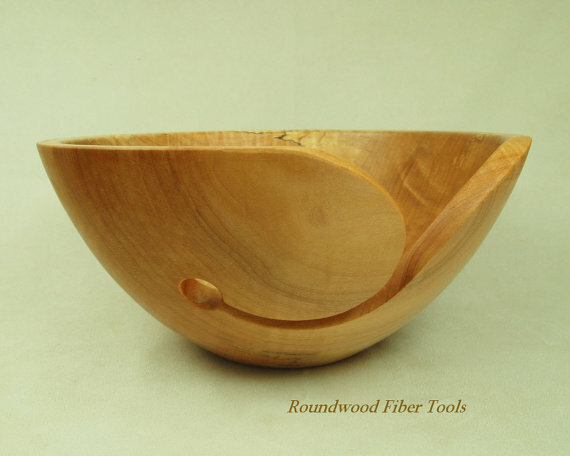 Yarn bowls also have a swirl carved into one side so that you can remove your project from the bowl at any time and will often have a hole on the other hand in case you want a more secure attachment to the bowl and you know that you won’t be removing your project until you finish. 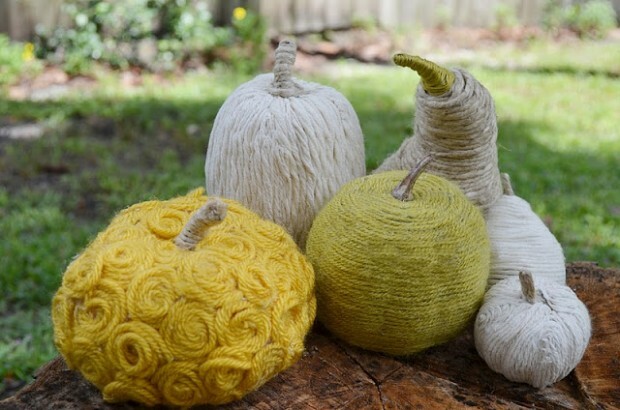 Finally, if you are working on a project that uses more than one colour of wool, you can use more than one yarn bowl and it will help keep your wool from getting tangled! If you put both skeins in a normal project bag, you could end up with one big giant mess! Now I’m going to share with you some of my favourite handmade yarn bowls! 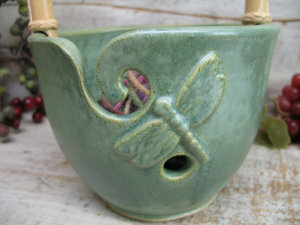 Beautiful dragonfry bowl from Heidishoppe. Gorgeous twisted leaf bowl from blueroompottery. Marietta from blueroompottery has given our readers a 5% discount on purchases over $28.00 from her store, just by typing in the coupon code CRAFTHACKERS5, expires on Nov. 21,2014. 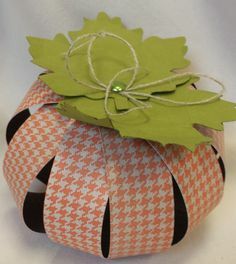 You can get your very own beautiful twisted leaf bowl or pick from several others in her store. 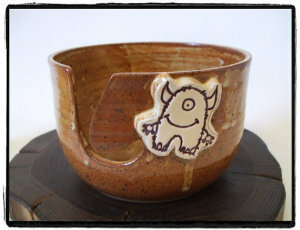 How about a monster on your bowl from misunrie? How cute is he?? Simple and beautiful from nealpottery. I suggest that you go on a search for your favourite bowl! I can’t wait to own a whole series of knitting bowls myself. They combine my love of pottery with my love of knitting. Could I ask for more? This person’s work just showed up on my dash this week and I couldn’t keep his beautiful skill all to myself. 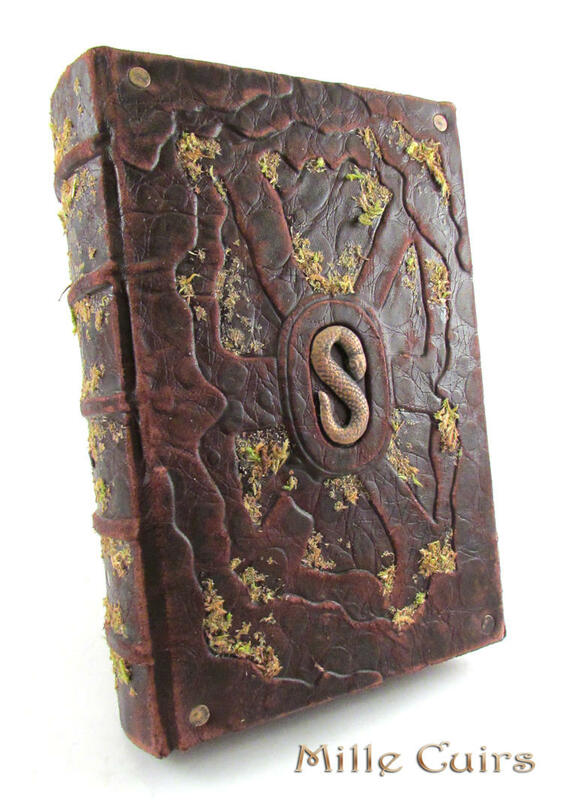 I would love to just pick his brain on how he comes up with his original ideas and then the methods he uses to treat the leather (yeah, these are all made with real leather, btw). 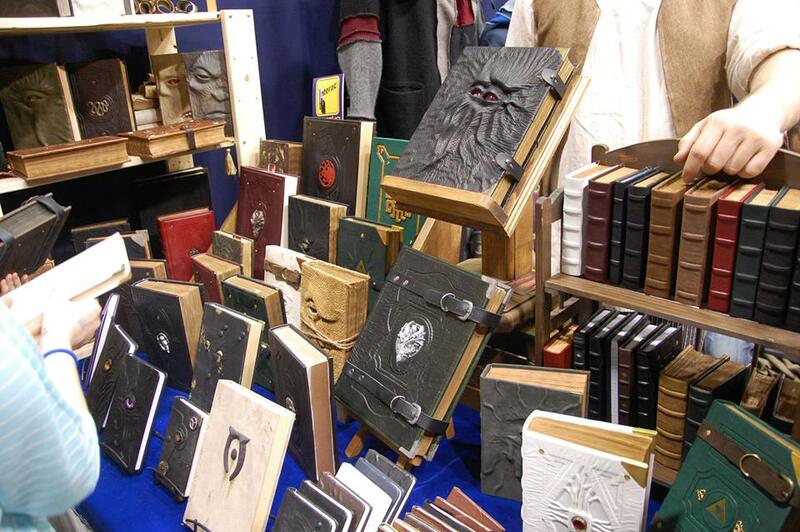 If you love books/art you do yourself a disservice by not checking out his work either on deviantart, or on facebook. You may remember I featured Absynthetika back on August 11th and the fantastic hand made corsets they create. Megan had a great idea that a corset guide would fit in nicely with the Craft Hacker tutorials and I completely agree! This guide is for how to find that perfect corset that will compliment your body. It is very lengthy (like all good tutorials are) so I have split it up into segments that will be featured every Saturday in September. This week’s segment is all about shape of the garment, side seams, and pattern matching. So written by Megan of Absynthetika, here is week 4. Shape of the actual garment and side seams. Remember, the cut of the garment is what is going to change your body. When you look at a corset, you should be able to see this curve even if the garment is sitting on a table. Look for it. If you can’t find a curve in the side seam, it will not shape your body. It should be a clearly defined point above a hip curve. Different corsets will have different degrees of waist cinch, but it shouldn’t be just a gradual flare. It should look a little like an hourglass which has a definite midsection, rather than a gradual curve. With this corset you can see her defined waist, smooth lines, no wrinkling fabric. (Oh, and this happens to be the fantastic Megan herself as the model). When you buy a corset with a pattern in the fabric, there is always the issue of matching. I’ve read multiple things on this and I have my own opinion. Pattern matching is beautiful and shows the skill of the sewer when it is done properly. Being realistic, if you find someone who is a great seamstress but is struggling to juggle a small business with paying rent, you may find that they don’t always do it. With patterns that you can see, I will normally try to match. But with those that you can’t, I usually won’t, not because I’m lazy but simply because I don’t have the extra time to spend sometimes. It is important that if a larger pattern isn’t matched, that it be positioned to look nice, otherwise that is just sloppy. In this picture you can see a defined waist. There is no gapping, it fits snugly, and the edges are matched and even and so is the pattern of the fabric. All good things. Next Saturday will be the last week of the corset guide. We will be looking at wearing out, storing, and prices. Have you ever wanted to redecorate your home but don’t have the money to buy all new furniture? 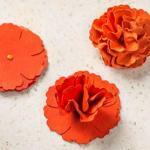 Fix.com has the crafty solution for you by giving your furniture a facelift instead. Fix.com is a lifestyle blog that is devoted to bringing you expert content make your life easier. 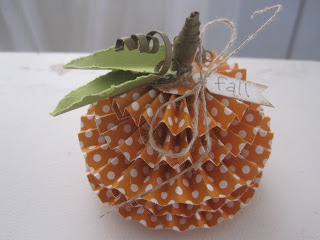 If you liked this tutorial, then check out the other ones they offer on their site. There is a ton of information about basic things in your life such as gardening, exercise, camping, home decor, and more. There’s something really awesome about wool. Its softness and squishiness and fact that you can turn it into pretty much anything makes it one of those materials that I just need to work with! I’ve always found the process of making yarn intriguing and I think we need to learn a bit more about it. Today we’re going to be talking with Caryn Vainio of The Glorious Grazers. Caryn makes her own wool from the alpacas she raises. We’re going to walk through the process of making wool from “scratch”! 🙂 First I have to say, though, that I love the yarn from The Glorious Grazers. 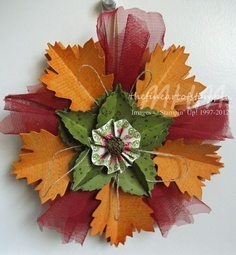 The colours are wonderful and I must say that I may just have some on its way to me. The wool I picked out is called Grape Soda and Bubblegum! Can you guess what colour it is? Now, let’s get on with the questions! 1) Can you list your steps for the process of creating wool for sale? 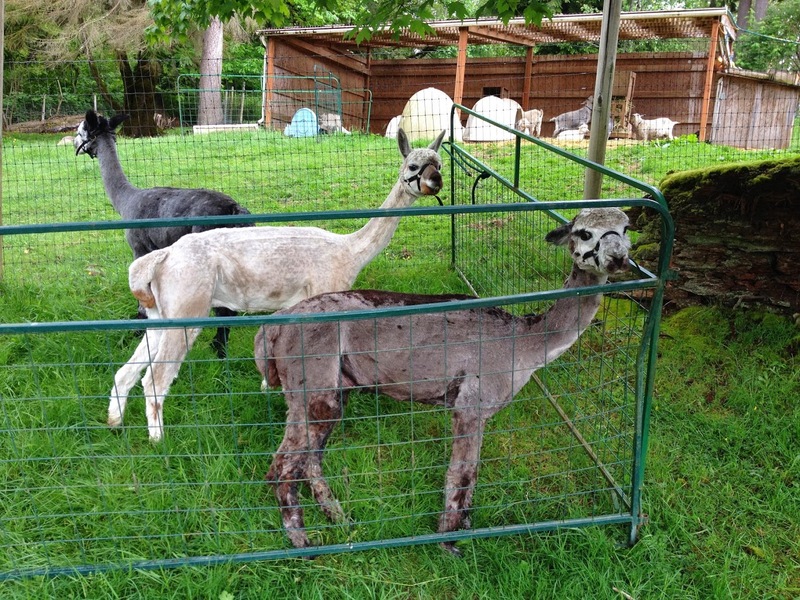 First, it starts with shearing the alpacas, which we do every year on Memorial Day weekend. Once the wool is sheared, I either wash it myself or send it all out to be washed (easier that way!). Then, I process it – I’ll either card it or comb it, depending on what I want the end product to be. 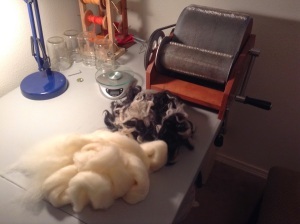 If I’m selling carded batts, I’ll card it on my drum carder. Sometimes I blend the alpaca with other fibers first, like silk or Tencel or bamboo. I do spin my fleece into yarn once I card it. I have two spinning wheels and several spindles. 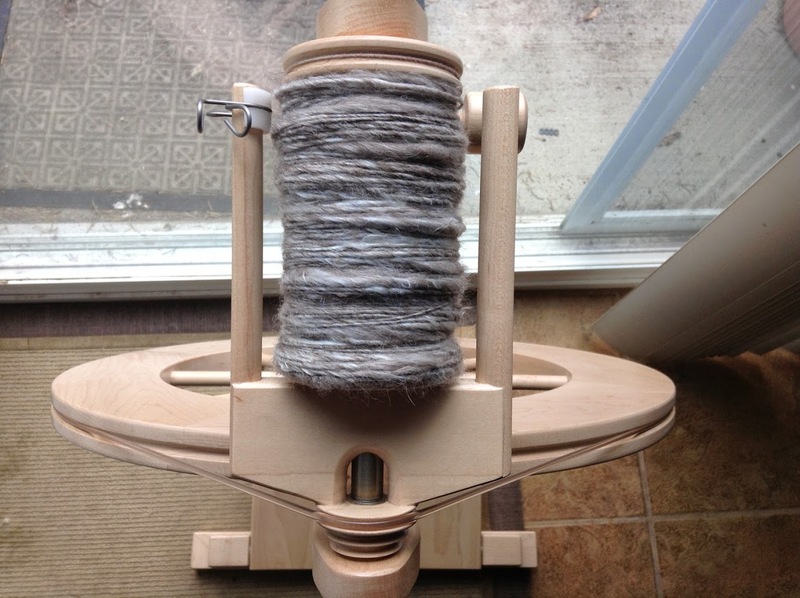 I usually spin on my wheels for things I want to finish quickly, but I’ll often have a project going on a spindle for me to pick and work on whenever I have a few minutes. 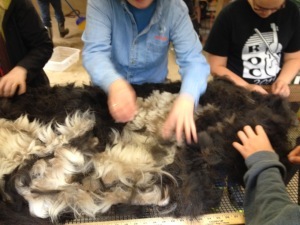 Skirting Benz’s fleece just after it’s been sheared. Skirting is the process of removing sections of the fleece that are dirty or coarse. 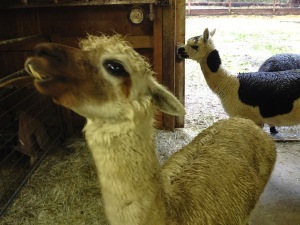 2) How many alpacas do you have? We have four: Benz, Cinnamon, Silverton, and Indie. We got the first three together from the same farm several years ago, and then Indie joined the family as a rescue about three years ago. 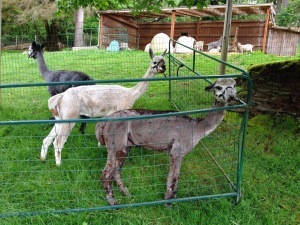 Here’s Silverton, Cinnamon, and Indie (from back to front) just after shearing. Cinnamon goofing around with Benz behind him. 3) What is the dyeing process like? How many different colours do you make at a time? I love dyeing fiber! 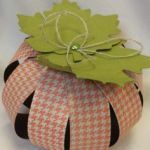 The process is different depending on what you want the end product to be, but frequently I do crockpot dyeing – I have a crockpot I use just for doing that. I fill it with water, put the fiber in, and then add my dye powder and vinegar. If I want to do a solid color, I’ll put one color in and stir it before I cover it and let it simmer on low until the water is clear (that means the dye has been taken up completely by the fiber). If I want to do multiple colors, I’ll sprinkle the dye powders over different sections of the fleece in the crockpot, and the colors will generally stay close to the spots you put them in, but spread just a little bit. There are other dyeing processes I’ve used as well. I’ve spread fiber out into a foil turkey pan, sprinkled dye powder over it as it sits in water and vinegar, and baked it in an oven until the water is clear. 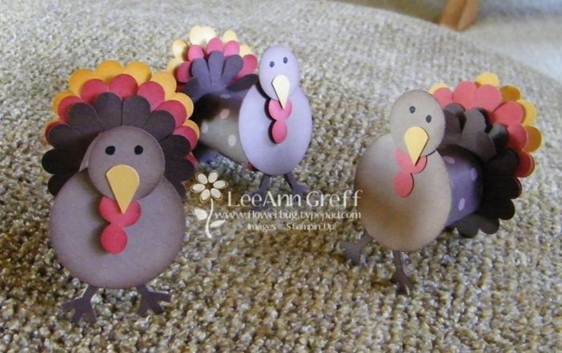 The results are similar to crockpot dyeing, depending on how big your crockpot is. I’ve also spread fiber in a long rope on a table and used squeeze bottles of prepared dye liquid to dye in very specific patterns. The process is half the fun! Some of Indie’s fiber combined with silk, being spun into yarn. My drum carder in my fiber studio, with some fiber I’m about to card. 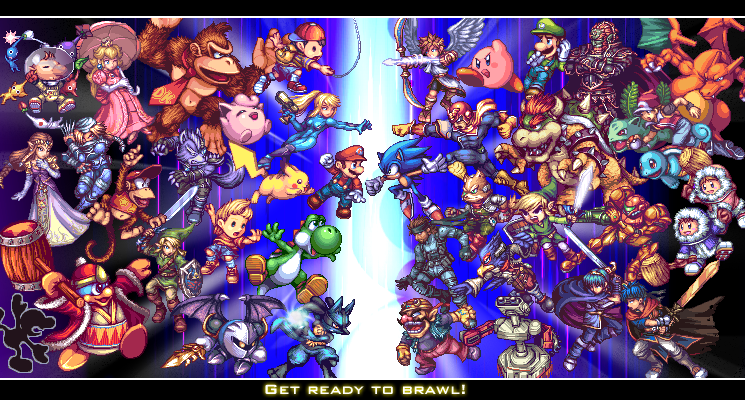 Something that crosses over, usage wise, into all sorts of mediums for video game based art is the use of sprites. The pixel system is so versatile and expressive that crafters have been using it to express how much they love their games for quite some time now. Perhaps another day I’ll go into the history of it, but for today, I want to celebrate an artist that creates such beautiful pixel work that it’s likely you’ve seen it around before. AbyssWolf is a Spanish artist that has been making these beautiful pixelated bits of art for over 8 years now, and I certainly hope he doesn’t stop anytime soon! When I found his work back during my college days, his art was already spreading like wildfire around most custom sprite sites/forums. While his sprites have grown in size as his talent, the original designs were all around the same height and shape; designs which he’d planned on using in a card based system at first, and later as Street Fighter style game. 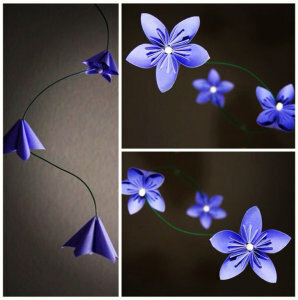 Of all the crafts I have tried over the years, I don’t think I’ve ever failed as completely as I did with origami. Either my brain just wasn’t built that way or my hands didn’t want to or couldn’t move that way, I have no idea. Trust me, I tried. Several times. All I know is that I cannot do it so I am always amazed at those who can! 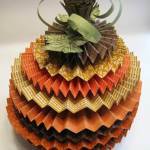 One such person is Melinda from Meligami whose handcrafted paper creations are pretty awesome! From ornaments to flower mobiles, her attention to details is incredible. 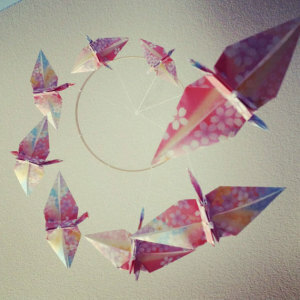 Just imagine going with sleep with this beautiful floral crane mobile over your head! Melinda (@Meligami) can also be reached through Twitter and Instagram so you can check out more of her masterpieces! Next weekend Nicole and I will be at Awesome Con in Indianapolis. “Wait” you say, “isn’t Awesome Con in Washington, DC?” Yes! But now Awesome Con has expanded to include Indianapolis and Milwaukee. We are not able to attend Milwaukee, but we will be at Indianapolis next weekend and will bring our Crafty Thinking panel as well. The guest list is unbelievable. You can see Adam West, Alan Tudyk, Bryan Tillman, Bryan Turner, Burt Ward, Kevin Sorbo, Mark Sheppard, and so many many more. I am so excited that they are bringing Super Art Fight to Indianapolis! If you haven’t seen super art fight, you REALLY need to. So make plans now to head to Indianapolis next weekend and stop by and say hi! We will have a Meet the Hackers post next Friday with all of the details about where we will be located and when our panel will be. Please just make sure your pictures are the equivalent of a ‘G’ or ‘PG’ rating, of course. Each weekly post will have a theme/genre to it so swing by sooner rather than later if you have a costume you want highlighted, as I won’t be adding anything in after the respective post has already gone up. 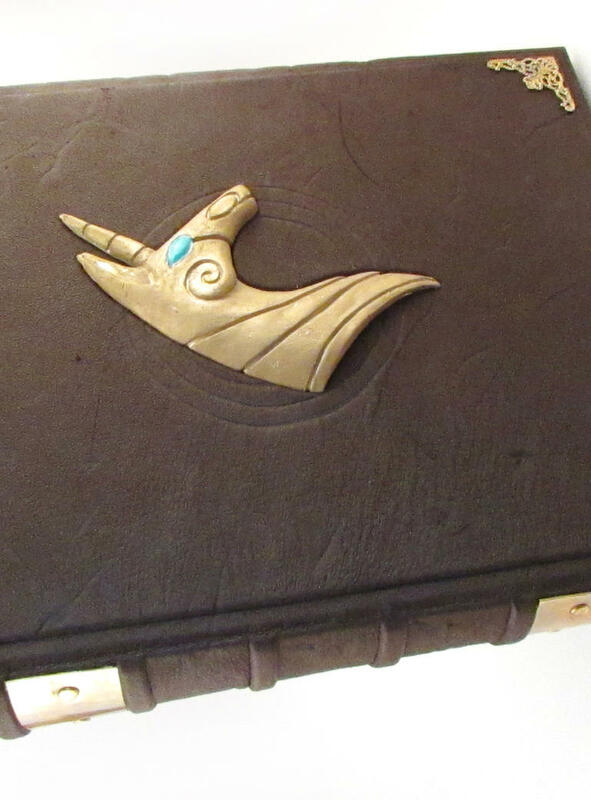 Ideally I’d love to end it with a feature post on costumes from forum members alone, but I know not everyone dresses up or is comfortable with that so….we shall see.